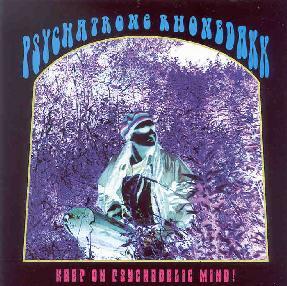 Psychatrone Rhonedakk - "Keep On Psychedelic Mind!" Psychatrone wears his psychedelic influences on his sleeve, and is proud of it. He even goes so far as to list them in his liner notes, bands both neo and original wave, such as Trembling Strain, Can, Fifty Foot Hose, Silver Apples, Bevis Frond, Amon Duül I & II, Flying Saucer Attack, Jimi Hendrix, and many others. He insists that Keep on Psychedelic Mind! be viewed as merely a tribute to those artists. And while he does do a couple of very cool covers, including Robert Calvert's classic The Right Stuff, and Radar Eyes by Godz, most of the material on the album is Psychatrone's originals. Whether he cares to admit it or not, he's put his own unique stamp on some far out, trippy and exciting music and deserves a place amongst those he reveres. Although he uses mostly synthesizers, Psychatrone never sounds really that electronic. I am reminded of some of the early synthesizer experiments that the more psychedelic rock bands were doing back in the 1960's. Psychatrone can gurgle away with the best of them on the keyboards, but also evokes wild, analog style sounds that remind one of wailing electric guitars, and crunching percussion. Mynd kicks things off, a dark, slow meditation with plunking piano and rhythmic percussion and voices chanting "my mind" throughout it (Psychotrone's mind is obviously a weird place to be). His cover of The Right Stuff is pounding, gritty, and spacey, with great lo-fi vocals and trippy syth soloing. The first half of Bad Trip #2/Instant Karma is pretty self-explanatory. The latter half is not a cover of the old John Lennon tune, but a bizarre "cut-up" of an 8-track tape of Pharoah Sanders' Karma (since Psychatrone gives a plug for this amazing psychedelic jazz classic in his liner notes, I will too-if you've not experienced Sanders' incredible, spiritual, mind-bending 1969 masterpiece-check it out!). Despite his obvious love for all things psychedelic, Psyhatrone must have had a few bad experiences as well, if Bad Trip # 2 and Paranoid LSD Trip are any indication. Both pieces are quietly unsettling, yet add to the overall strange and dream-like feel of the album. Theme from "Acid Mother Lovers" is a freaked out, intense instrumental, with plenty of whooshing synths, and jittery sequences, whereas Shimmer/Psych Bubble has more of a summery feel to it, and features some trippy guitar by Brian Turner. Rite On is another eerie meditation with tinkling chimes, trancy percussion, and strange synths. Pychatrone does a very minimalist cover of Radar Eyes, that has an almost Eastern feel to it, and great chant-like and whispery vocals. Brian Turner returns to contribute guitar to the darker and hypnotic, 7-minute long instrumental trip Heathaze. Sulphur Mines of Jupiter is a pure synth solo, but don't expect something soothing and ambient. This piece is short, but burns like the fires of a distant world, and sounds more like a distorted electric guitar freakout. Oh Well lightens things up, drifting in cosmic space to a weird, clunking rhythm, for over 7-minutes. According to the liner notes, the final track on the album, May the Circle Remain Unbroken, was "originally a product of Roky Erickson's imagination". (For those who don't know, Erickson is sort of the "American Syd Barrett", acid casualty, and brilliant mind behind the classic 1960's pysch/garage band The 13th Floor Elevators). It's another Eastern tinged meditation with haunting vocals. But wait! Don't hit that stop button yet! You'll miss one of the best parts of the album! There are two hidden tracks here. The first occurs about 35 seconds after the end of the "last" track, and is a short, disturbed bit of electronic madness (Bad Trip #1, perhaps?). About 10 seconds after that is a smoking, freaked out space odyssey that lasts for another 5 minutes. This track is not to be missed! In fact, this whole album is not to be missed. Psychotrone Rhonedakk, while exploring the past, looks instead into the future of psychedelic music, and creates one of the most far out and refreshing listens of recent years. Explore his psychedelic mind! For more information you can visit the Summersteps web site at: http://www.geocities.com/summersteps/. Contact via snail mail c/o Summersteps; PO Box 447; Moscow, PA 18444.